Courts • The prosecution says MacNeill poisoned his wife to continue an extramarital affair. Michele MacNeill, shown in this undated family photo, died in April 2007 under mysterious circumstances. 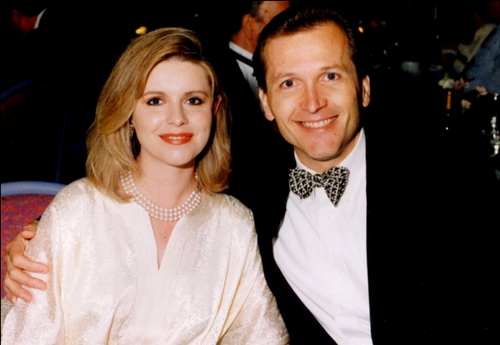 Five years after her death, prosecutors have charged her husband, Martin MacNeill, with her murder. Michele MacNeill Michele and Martin MacNeill, seen here in an undated family photo, were the parents of eight children, including four daughters they adopted from Ukraine. 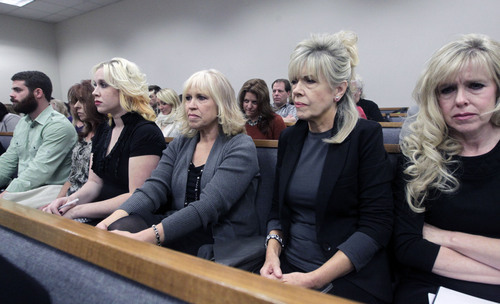 Al Hartmann | The Salt Lake Tribune Family members of Michele McNeill listen to testimony in Judge Derek Pullan's 4th District Court in Provo Thursday October 17 during the murder trial of Pleasant Grove physician Martin MacNeill. Martin McNeill is charged with murder and obstruction for allegedly killing his wife, Michele MacNeill in 2007 so he could continue an extra-marital affair. Al Hartmann | The Salt Lake Tribune Pleasant Grove physician Martin MacNeill, charged with murder for allegedly killing his wife, Michele MacNeill, in 2007 so he could continue an extra-marital affair appears in Judge Derek Pullan's 4th District Court in Provo Thursday October 17. Al Hartmann | The Salt Lake Tribune Pleasant Grove physician Martin MacNeill, charged with murder for allegedly killing his killing his wife, Michele MacNeill, in 2007 so he could continue an extra-marital affair appears in Judge Derek Pullan's 4th District Court in Provo Thursday October 17. 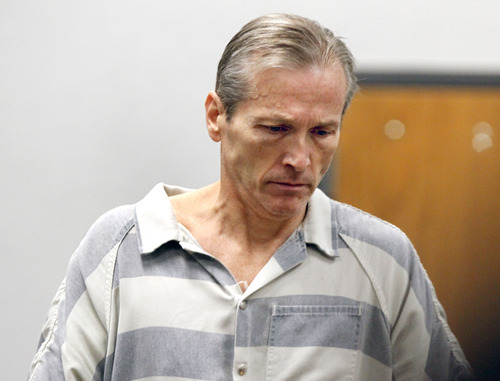 Al Hartmann | The Salt Lake Tribune Pleasant Grove physician Martin MacNeill, charged with murder for allegedly killing his killing his wife, Michele MacNeill, in 2007 so he could continue an extra-marital affair appears in Judge Derek Pullan's 4th District Court in Provo Thursday October 17. Al Hartmann | The Salt Lake Tribune Pleasant Grove physician Martin MacNeill, charged with murder for allegedly killing his killing his wife, Michele MacNeill, in 2007 so he could continue an extra-marital affair appears in Judge Derek Pullan's 4th District Court in Provo Thursday October 17. 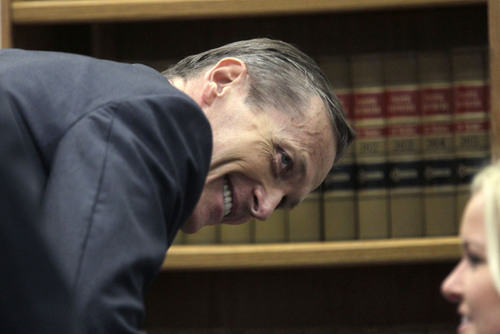 Al Hartmann | The Salt Lake Tribune Pleasant Grove physician Martin MacNeill, charged with murder for allegedly killing his killing his wife, Michele MacNeill, in 2007 so he could continue an extra-marital affair appears in Judge Derek Pullan's 4th District Court in Provo Thursday October 17. 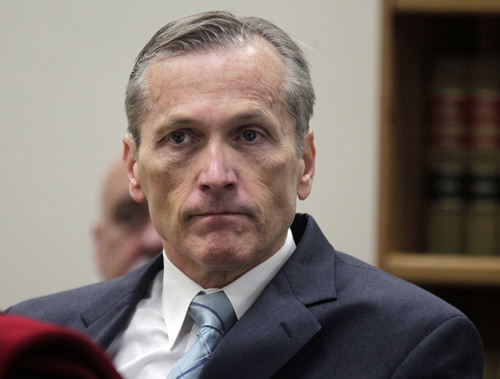 Al Hartmann | The Salt Lake Tribune Pleasant Grove physician Martin MacNeill, charged with murder for allegedly killing his killing his wife, Michele MacNeill, in 2007 so he could continue an extra-marital affair appears in Judge Derek Pullan's 4th District Court in Provo Thursday October 17. 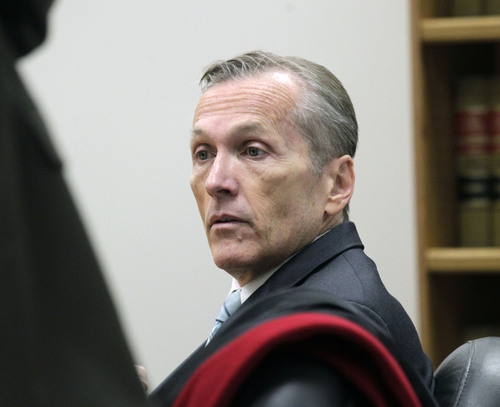 Al Hartmann | Tribune file photo Martin MacNeill, a doctor accused of murdering his wife, appears in 4th District Court in Provo in October. 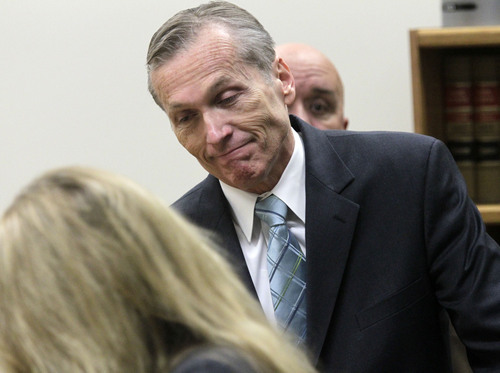 A judge on Monday ruled that for the first time in Utah, TV cameras will be allowed to live broadcast a criminal court trial when MacNeill faces a jury in mid-October. 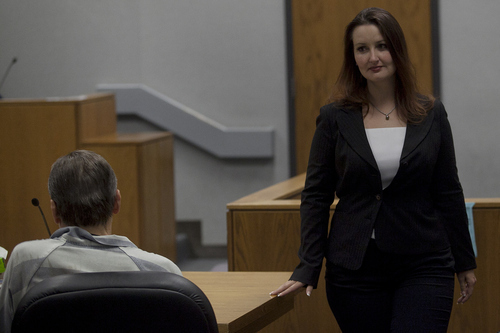 Mark Johnston | Daily Herald Witness Gypsy Willis passes defendant Martin MacNeill after taking the witness stand during a preliminary hearing at the Fourth District Court in Provo Wednesday, Oct. 10, 2012. 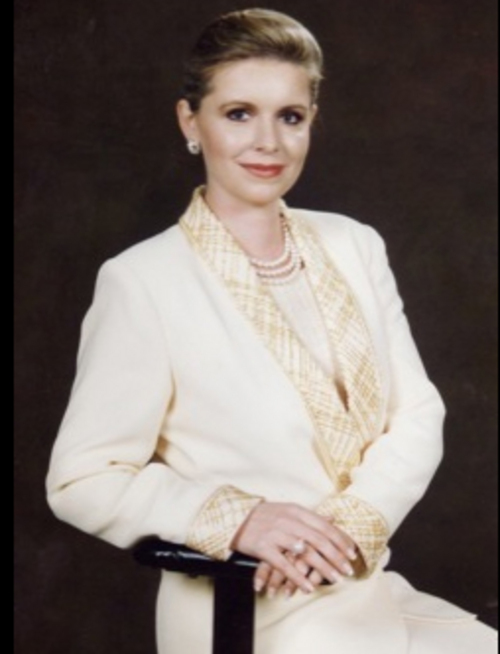 Though Martin MacNeill&apos;s defense attorneys argued Thursday that his wife was not murdered and died from natural causes associated to a bad heart, a doctor who examined Michele MacNeill just weeks before her death said she showed no evidence of heart disease. "I was shocked," Dr. Von Welch said about learning that Michele MacNeill had died. "Because at the time I examined her, she was healthy." Martin MacNeill, 57, is accused of giving his wife a deadly mixture of prescription pills after she came home to recover from plastic surgery in April 2007. A trial for the man, who is charged with murder, a first-degree felony, and obstruction of justice, a second-degree felony, began this week in Provo&apos;s 4th District Court. Prosecutors allege Martin MacNeill was driven to murder to get rid of his wife in order to continue an affair with a woman named Gypsy Willis. Welch testified Thursday that he gave Michele MacNeill a pre-operative exam on March 29, 2007, in preparation for a facelift surgery. He testified that Michele MacNeill told him that she was depressed and stressed, and he recommended a prescription for Zoloft and advised that she postpone the plastic surgery until she could lower her blood pressure. But the facelift procedure went forward as scheduled on April 3, 2007. Just eight days later, Michele MacNeill, 50, was found dead in her bathtub by her young daughter. Scott Thompson, the surgeon who performed the upper, middle and lower facelift on Michele MacNeill, testified Thursday that Michele MacNeill&apos;s surgery was uneventful and normal, and that he was "very upset" when he heard his patient had died. He received a call from Martin MacNeill on the day that the woman was found in her bathtub. "I don&apos;t like complications with my patients," Thompson testified Thursday. Thompson testified that he was initially concerned that Michele MacNeill was not walking around enough post-surgery and may have developed a blood clot that killed her. His second concern was about the level of medication the woman was taking, especially since Michele MacNeill was given more drugs than the usual patient, he testified. Usually, Thompson said he prescribes an eye drop, an antibiotic, a steroid, some pain medication, a sleeping aid and possibly an anti-nausea drug; that suffices for most patients. But when Michele and Martin MacNeill came to his office in April 2007, Thompson deviated from his normal prescription levels, prescribing the woman extra prescriptions for painkiller Percocet and Valium, for anxiety, he said during testimony. He would not normally prescribe this level of medication to his patients  "I just don&apos;t trust their ability to use the medications properly," he testified  but because Martin MacNeill had introduced himself as a physician and an attorney, Thompson obliged with the doctor&apos;s request for extra medication. "Martin indicated to me that he was very concerned about his wife," Thompson testified. "That she didn&apos;t handle pain well, and was anxious." Thompson and Welch have been the only witnesses to testify so far in Martin MacNeill&apos;s trial, which is scheduled to run for the next five weeks. Attorneys also delivered their opening statements Thursday to jurors. 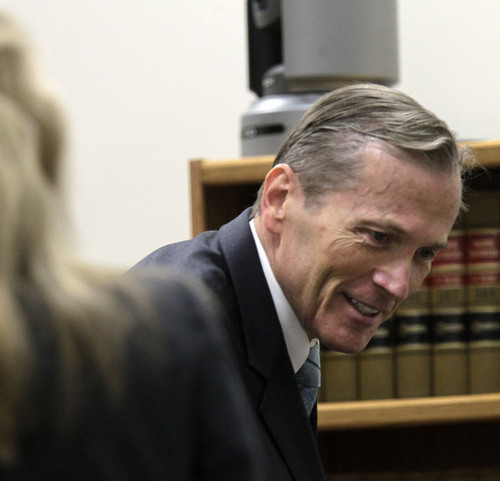 Deputy Utah County Attorney Sam Pead took the time to provide a timeline about the days leading up to Michele MacNeill&apos;s death, emphasizing Martin MacNeill&apos;s strange or erratic behavior in the moments and days after his wife&apos;s death. 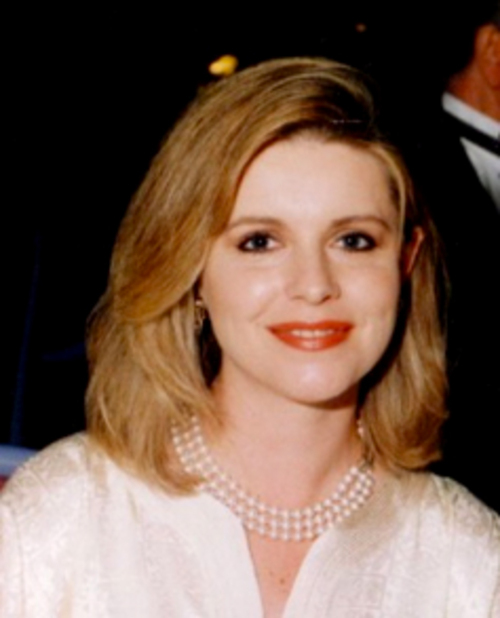 Pead also detailed that Martin MacNeill had several affairs during his marriage, most notably with Willis, who moved into the MacNeill home just days after Michele MacNeill&apos;s death to work as a "nanny" for the younger MacNeill children. "This is a puzzle with many pieces," Pead told the jury. While Pead focused on the narrative of Michele MacNeill&apos;s death, Martin MacNeill&apos;s defense attorney, Susanne Gustin, focused her opening statement on the medical evidence and science connected to the woman&apos;s death. "[Medical experts] agree that Michele&apos;s heart disease was the cause or contributing cause to her death," Gustin told the jury. "None of the medical examiners believe that Michele&apos;s death was due to a homicide." Gustin told the jury that there was no evidence of any struggle prior to Michele MacNeill&apos;s death, and she noted that medical examiners found that the drug levels found in the woman&apos;s system were not extraordinarily high. Gustin accused Utah County Attorney&apos;s Office investigators of starting their investigation backward. "They started with the premise that Martin killed Michele," she said. According to court records, MacNeill&apos;s defense attorneys have filed notice that they plan to use an "alibi defense," claiming that Martin MacNeill was at his office at the Utah Developmental Center in American Fork at the time that his wife died. On April 11, 2007, the couple&apos;s then-6-year-old daughter discovered Michele MacNeill in a bathtub, her eyes open and not moving, wearing a track suit, according to the girl&apos;s testimony at a preliminary hearing last year. The father told the girl to go to the neighbor&apos;s to get help, while he called 911. But in a recording of the 911 call, Martin MacNeill&apos;s words are nearly inaudible as he screamed at the dispatcher for help. He gave an incorrect address and hung up on the dispatcher twice. Prosecutors believe MacNeill lied to the dispatcher about performing resuscitation and lied to police about events surrounding his wife&apos;s death in an effort to hinder, delay or prevent any investigation. 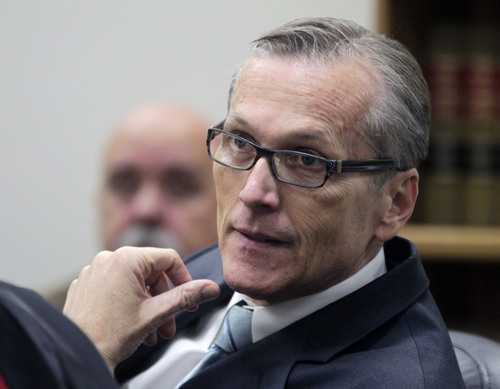 Though the Utah County Attorney&apos;s Office began investigating Michele MacNeill&apos;s death in 2008, charges were not filed against Martin MacNeill until 2012. The state medical examiner has never ruled Michele MacNeill&apos;s death a homicide. After an autopsy in 2007, her manner of death was ruled "natural," the result of "chronic hypertension and myocarditis, which are capable of causing acute unexpected arrhythmia and sudden death." In recent years, other experts have also reviewed the case. A University of Utah professor of pharmacology and toxicology said he believed Michele MacNeill had taken a potentially lethal dose of medication. A medical examiner in Florida determined the immediate cause of death was drowning and that, contrary to the Utah medical examiner&apos;s findings, there was no evidence of acute or active myocarditis.